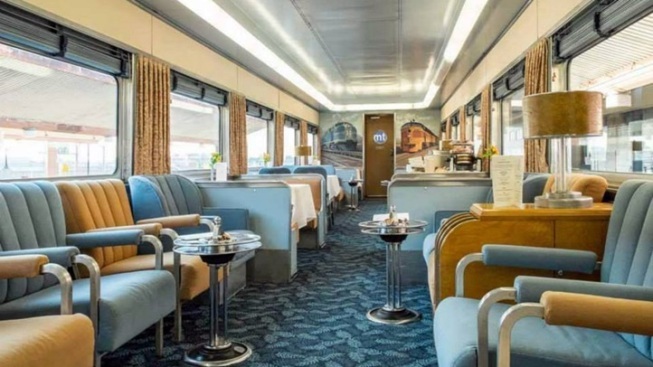 Enjoy a rare chance to ride the rails inside a 1949 Overland Trail car. Enjoy a rare chance to ride the rails inside a 1949 Overland Trail car this fall. OVERLAND TRAIL CAR, one that is about as Streamline Moderne as railcars come. Think tasteful carpeting, muted textiles and tones, and the sort of light fixtures that reigned eight decades ago or so. Surely you'll have to wear your Peggy Carter-style two-piece suit, or something Clark Kent might have donned, to sit on the retro chairs. As for food and drink? You're allowed to bring your own, though wine, coffee, and a few other beverages will be for sale. The date is Saturday, Nov. 12, and while traditional fall colors don't dominate the area where the track runs, you will, fingers crossed, sense a crispness in the air. Will such crispness call to mind a train station scene from a period romance? We have to think it can only enhance the vintage day out on the rails. MORE ART DECO DELIGHT: The train ride is open to ADSLA members, so getting a seat might be a mite tricky. Here's a delicious Deco-lovely alternative, should you miss the ride: A vintage party on the Queen Mary in Long Beach from Aug. 19 through 21. The spirit of the era, from fashion to architecture, will reign, so keep your seamed stockings and pearl-button'd gloves in tip-top shape.